Soon pears will not be in season in our part of the globe ; so now is the time to stock up ! I buy a few, peel and core them, cut them up, and put them to cook on low in a saucepan with a little water at the bottom. The water is necessary to start the cooking but then the pears start rendering their own juice. No need for sugar. I puree them as I would for baby food, and then freeze this all natural homemade pear sauce in small batches (35 to 40 g) inside the cups of a silicone muffin tray. After unmolding the frozen batches I keep them in a plastic bag in the freezer and know I can make crêpes well into late summer. I do not buy pears between May and October any more, for fear that they will have traveled far and be subjected to some kind of treatment that will disagree with my Significant Other’s metabolism. Back to the subject of crêpes. Have you ever made them? Back in the days when I lived in the U.S., people were always impressed when I took some to work. The tradition lives on : our daughter now takes hers to college ; she told me she is planning to make a big batch for Mardi Gras – « Fat Tuesday », in other words, the last day we are allowed to splurge before Lent starts on Ash Wednesday. The only difference between those I used to make then and now, and it’s a big one, is that they are gluten and dairy free. My very first attempts were a little sad : too dry. Then I started adding apple sauce ; quite an improvement ! This latest version is even better, thanks to 1) the pear sauce I include in the batter and 2) the addition of a little chestnut flour, to be used sparingly. If you put too much the chestnut flavor gets overwhelming I find. 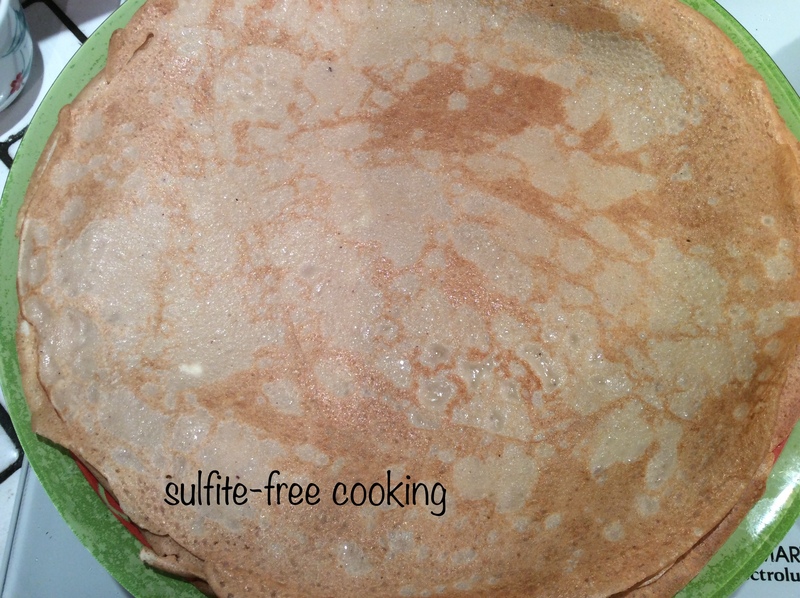 I have also tried using more rice flour but no starch ; the crêpes come out less fluffy. Just letting you know that it is an option, but the result will be different in texture. Maybe adding more pear sauce would help? Would mashed squash give a similar result ? It’s up to you to try and let me know. As for me and as of now I feel I have had my fill of crêpes for a while, thank you 😁 ! – 40 g (1.4 oz) organic tapioca starch / flour ; we have never had problems with it . You will note that there is no sugar in my batter. It’s a personal preference as I usually spread jam (homemade) or agave nectar on my crêpes. Of course, please feel free to add some ! 1. Beat the eggs, add pear sauce, beat some more, and add non-dairy milk. 2. Prepare flour mixture in a large bowl, adding salt if so desired. 3. Make well in the center of the dry ingredients and pour some of the thick liquid (from step 1) in it. Working with a fork or a wooden spoon (my personal preference in spite of the photo), stir, barely scraping the flour at each round in order to let the flour gradually fall and be mixed with the liquid. Add more liquid every time stirring gets more difficult. Proceed until all liquid and flour have been combined. Batter should be smooth ; no lumps, please ! 4. Let batter rest for an hour or so in a cool place. It will slightly thicken. At this point, add 1 to 2 TBSP water and stir well ; it is now time to cook your crêpes ! 5. Heat a non-stick skillet, lightly brushed with olive oil. Lift the skillet from fire and pour a ladleful of batter in the middle of the pan, moving skillet around and working quickly so as to have the batter spread all over the surface. 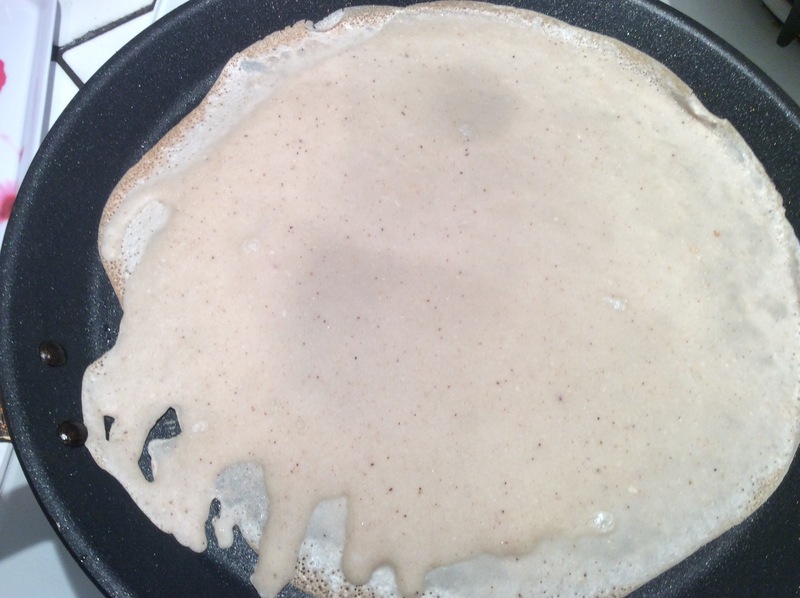 The crêpe should be thin, so don’t pour too much batter. Cook the first side over low to medium heat until the edge turns brown, then flip the crêpe with the help of a spatula, your hands even (mind the heat! ), or, if you feel lucky, with a quick jerky movement of your wrist… I NEVER attempt this but some people like to live dangerously ! The tradition is that if you successfully flip the first crepe while holding a golden coin in your left hand you will be wealthy… Which might explain why I never got rich! Look at the edge: it’s time to flip the crêpe! The second side of the crêpe cooks faster. Slide onto an oven-proof dish, cover and keep in a warm place (for instance, your oven set on low) until all your crêpes have been cooked. You can also warm them up in the microwave, one at a time. I hope my explanations are clear enough to make you want to try making this delicious traditional French dessert, but just in case, here is a link to help you visualize how crêpes are cooked. The chef explains that the tiny bubbles in his crêpes are due to the beer he put in the batter ; he also says beer makes them very light. And if you are feeling nostalgic, here is the unforgettable Julia Child ; notice how she doesn’t worry one bit about spilling the batter on the side of her pan ! By the way, she mentions flaming the crêpes ; rum is a good option, normally sulfite-free, provided it is made with cane sugar and contains no additives. To be eaten with jam, sugar, agave nectar, maple syrup, chocolate spread, coconut flakes… There are endless possibilities ! Enjoy! A photo from a previous batch, without chestnut flour, so lighter in color. Previous a recipe that will make you change your mind about celery!